This image provided by Disney shows a product image of Disney Plus on a tablet. Walt Disney Co. will charge $7 a month for its streaming service that debuts Nov. 12, a gambit to undercut rival entertainment giant Netflix Inc. in an increasingly crowded field. The company unveiled the service Thursday on a sound stage used to make the original “Mary Poppins,” delivering an Apple-style presentation of the online product. The platform will be several dollars less than Netflix’s most popular plan, which runs $11, and will weigh heavily on Disney’s finances. Disney+ isn’t expected to break even for about five years. Beyond the price and technology, the service will live or die based on its content -- and that’s where Disney made a big statement. Disney+ will feature an arsenal of kid-friendly programming, including 13 classic animated movies, 21 Pixar features, original series, and material from its Marvel and Star Wars franchises. Disney shares rose as much as 3.7 percent to $120.86 in premarket trading Friday. Netflix was down as much as 1.2 percent to $363.40. “We are confident this is a product people are going to sign up in droves to have,” Chief Executive Officer Bob Iger said in a Bloomberg Television interview with Emily Chang. Disney+ will begin rolling out to the U.S., western Europe and Asia in the first fiscal quarter, near the end of the calendar year. It will then arrive in eastern Europe and Latin America a year later. Disney plans to spend $1 billion on streaming programming in the next year, and it doesn’t expect to make a profit until fiscal 2024, when the platform could have 60 million to 90 million customers. Two-thirds of those subscribers will be overseas, the company predicted. Disney+ also will include “The Simpsons,” acquired in Disney’s purchase of 21st Century Fox Inc. entertainment assets last month. Borrowing the show’s cheeky tone, Disney presented a clip of the Simpsons family with a statue of Darth Vader on one side and Iger on a pedestal nearby. A signed photo of Rupert Murdoch -- the billionaire mogul behind Fox -- was in the trash. There was a “Welcome Synergy” sign above. The company previously had deals with Netflix and others to offer its content, but Disney gave up those partnerships -- and the revenue -- to make its own service more desirable. For Iger, Disney+ is a bit of a swan song. The company’s longtime steward reiterated Thursday that he expects to step down as CEO at the end of 2021, when his contract expires. The new product isn’t Disney’s only streaming platform. It acquired majority control of the Hulu TV service with the $71 billion Fox deal, and it’s now considering whether to expand that product overseas. A Hulu price cut, which lowered its entry-level, ad-supported version by 25 percent to $6 a month, helped bring a surge of customers, Disney said. Hulu expects to double its ad revenue over the next few years. 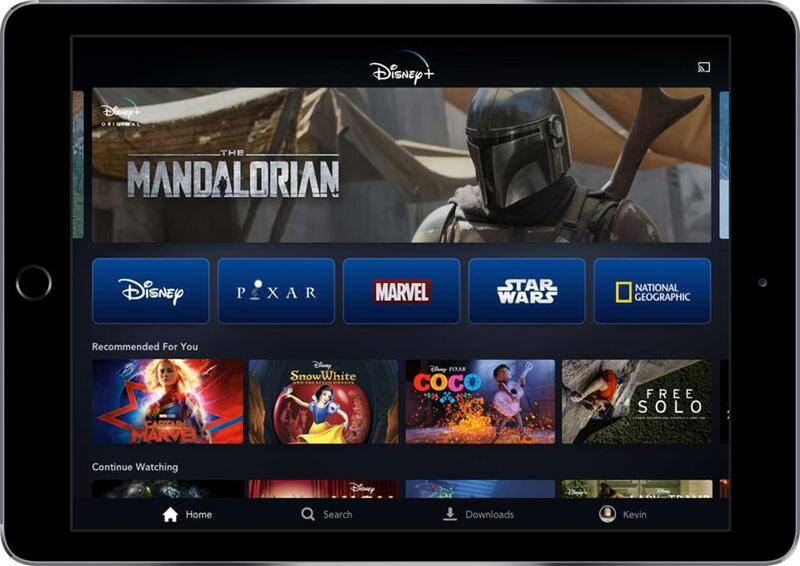 With Disney+, the company learned lessons from its U.K. launch of DisneyLife, which featured online access to albums, games and publications. Its latest U.S. price hike, announced in January, increased the cost of Netflix’s most popular plan by 10 percent to $11. Given Netflix’s grip on households, especially in the U.S., analysts expect customers to take the increase in stride.